Last Saturday, June 6, we had our record release party at Slim’s Last Chance in Georgetown. Our friends in Slow Code were kind enough to open the show for us. They put on a great show, as always. Be sure to check them out. We have a pressing of 500 records, with the first thirty being pressed in clear blue vinyl! There may be one or two of these still available. All copies have an embossed silver foil cover. The records will be available for sale at our upcoming shows, and hopefully at your neighborhood record store soon. Or, you can write us for a mailorder copy. 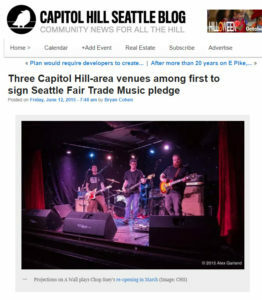 In other news, we somehow appeared on the front page of the Capitol Hill Seattle blog today. You can see it here.